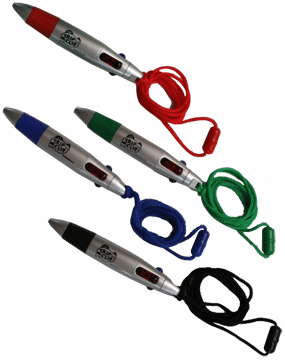 Each click-pen has 4 ink colors: red, blue, green, and black. The choice of pen color determines the color of the rubber grip and the string. The 15" braided rope has a safety break-away. The string can be attached to the clipboard to prevent it from getting lost. The cord can also be easily removed. Velcro lets your child easily attach the pen firmly to the clipboard, and then remove it when they want to use it. Buy 5 or all 35!